We have noticed something around our office: Brothers share a bond like no one else. Don’t believe us? Just ask our buddy, Luigi! When Mario needs to head to a far away land to rescue his sweetheart, Princess Peach, his bro Luigi grabs his overalls and hops down the tubes right alongside him. Talk about support. We can’t even get our brother to sign the birthday card we buy for our mom. This is just a level of brotherhood that makes us wish we had a Luigi, too. Hey, wait a minute...do YOU want to be our Luigi? 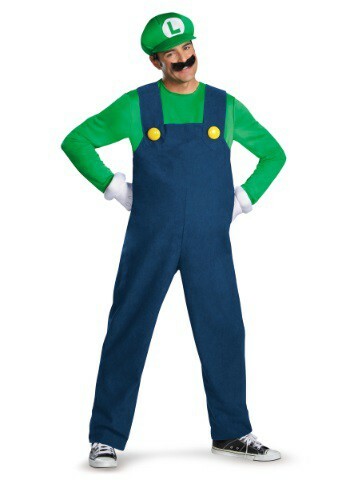 This Men’s Deluxe Luigi Costume can instantly turn you into the ultimate best brother in the universe! We’d do nice things for you, too, as often as possible. In fact, we may be even better than Mario at this whole brotherhood thing; we don’t have quite the same hero complex that he has. Let’s just try this officially licensed jumpsuit on for size. Oh boy, it fits perfectly! And it’s styled to look like Luigi’s blue overalls and green shirt, so we’re really feeling the whole “awesome brother” vibe. This costume comes with the necessary fake mustache, gloves, and even a detachable inflatable belly, so that from Bowser, to Koopa Troopas, and even the occasional bout of tennis, you look totally and authentically ready to have our back. OK, OK, Mario’s back. But you can’t blame us for trying.